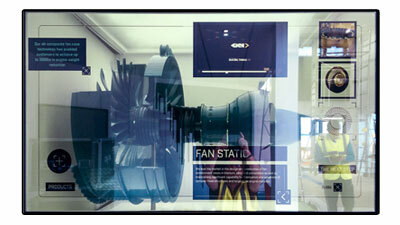 For a long time, transparent screens have been the stuff of sci-fi or ultra-hi-tech environments. Films such as Spielberg’s Minority Report helped to firmly cement transparent screens as a cutting-edge technology, putting them up alongside futuristic innovations like gesture interfacing. 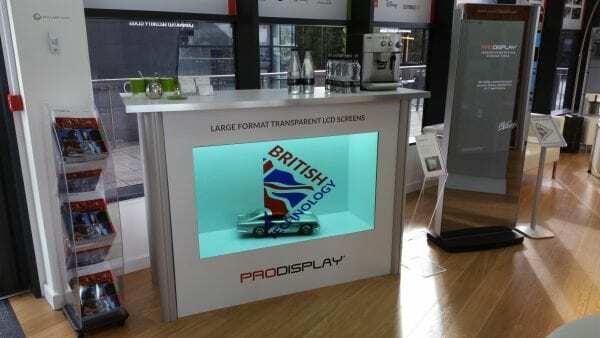 Pro Display is proud to be a British manufacturer that can offer such a great range of transparent screen solutions which satisfies a variety of requirements. Consumer’s technological and style tastes have been primed perfectly for this technology for decades through TV and cinema. However, transparent screen technology is not something you see every day- just yet. This puts transparent screens into a very unique position, where most people will know exactly what it is, but few will understand how it works. This ‘mystery effect’ alone can be enough to impress, but the beauty of transparent technology is 2-fold. Your customers will notice not only the technology itself, but also how you use it. 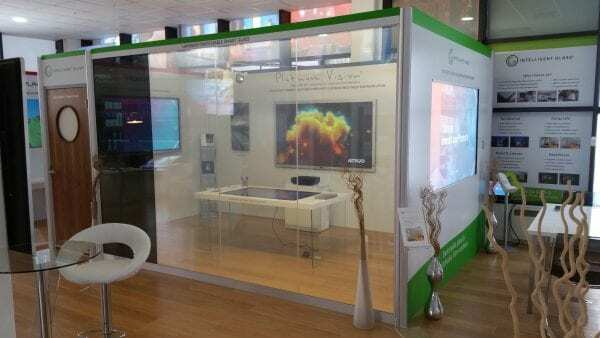 The versatility of transparent screens offers you an excellent opportunity to think up creative and innovative displays that competitors are unlikely to match. The ability to integrate media content with physical products is an area that few have explored to date- meaning that applications don’t even need to be that imaginative to be original. 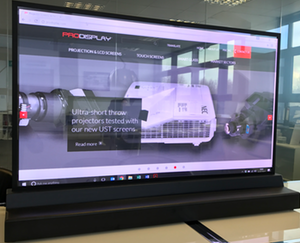 For those looking to really excite, our transparent technology can be integrated with our interactive touch technology, giving your screens the added benefit of touch capability. This makes for a truly remarkable display, allowing you to take customer engagement to a whole new level that will see audiences raving about you and your products. An innovative and high impact way to engage with your audience. A Transparent LCD Screen sees LCD technology fused with a transparent screen substrate, enabling white pixels to appear as transparent. Using this, merchandisers can produce media which hides or gradually reveals products behind the screen. 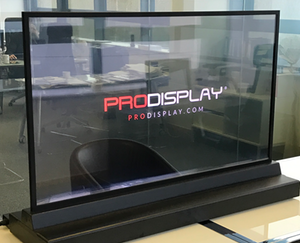 Requiring a backlight to display properly, our Transparent LCD Screens can come integrated with a display case, perfect for encasing new or leading products and unveiling them at your will. As mentioned above, our Transparent LCD Screens can be granted touch capability, adding interactivity alongside its benefits. Combining touch, stunning visuals and customer anticipation is a perfect merchandising mix that will see your products brought to life like never before. As with all of our transparent technology, Transparent LCD screens are incredibly versatile and can be applied in many different sectors. 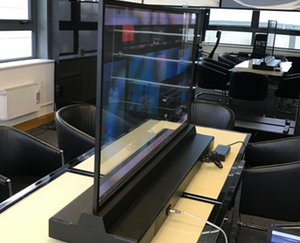 You can integrate the screen into display furniture, appliances or vending, shop window displays and even as part of a trade show display, product launch or visitor attraction. Transparent OLED, or T-OLED screens are a new development in display technology. 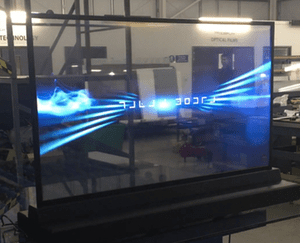 With a fully transparent surface, viewers can see what is displayed on the screen whilst still being able to see through it, allowing designers to overlay content like videos and images onto physical products behind the screen. What makes this technology special is that unlike Transparent LCD screens, it does not require a backlight or enclosure. Whereas Transparent LCD screens rely on backlighting to produce an image (and therefore require an enclosure or display box), T-OLED screens are made up of light emitting diodes which each emits their own light. There is also a subtle design difference in that T-OLED Screens display black content as transparent instead of white, like Transparent LCD. Because this product does not require a backlight to operate, the options of where you can apply it are considerably increased. 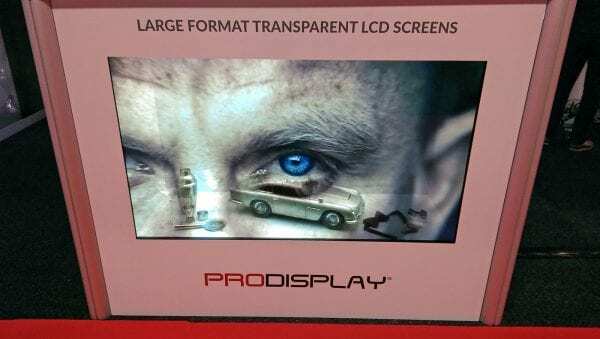 We have seen Transparent OLED screens used in interactive booths, digital signage, display cases, interactive games, vending solutions- the uses for this technology are limited only by your imagination. Clearview is a highly transparent optical diffusion projection technology which creates a holographic effect. So impressive are its features, that we have seen it specified on some of the world’s most impressive AV projects, including the 83rd annual Academy Oscars Awards. This technology is offered as an acrylic screen or even as a self-adhesive projection film, making it flexible to your requirements. 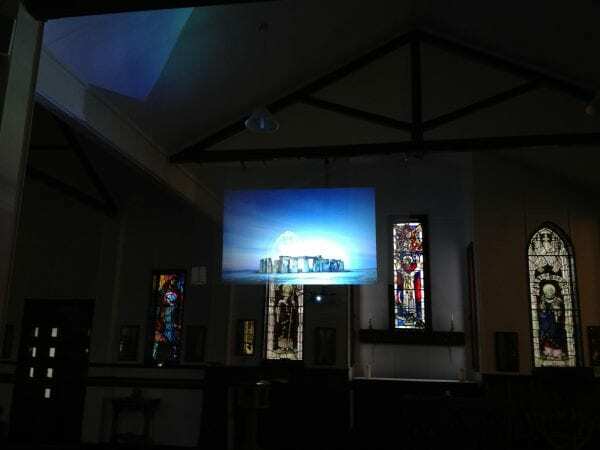 With no critical angle of projection, Clearview enables visibility even in brightly-lit environments due to its bright, sharp and vibrant display. Clearview offers a unique solution for those looking for something extra special. The Pepper’s Ghost style that it produces can be used for a range of applications, including window displays, glass walls & partitions, POS displays, museums, visitor attractions, exhibitions, live events and even concerts or theatres. We always encourage people to come forward with new and innovative ways to use our Clearview technology. If you can think of a great application, please get in touch. Wow your audience with our remarkable glass technology. Supplied as a glass or retrofit film and offering both privacy and practicality, Switchable Technology is one of our most versatile products. 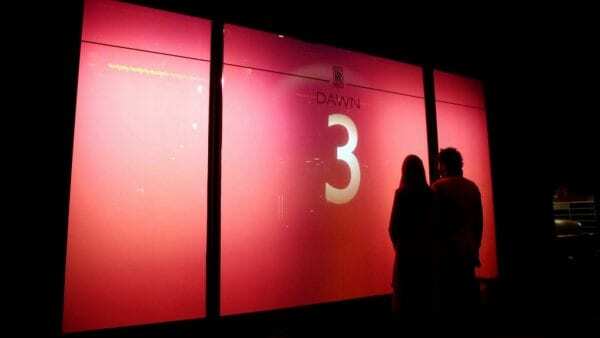 It operates using a simple on/off button, which switches the glass between transparent and opaque in an instant. Typical applications include office partitions, glass walls or meeting rooms, residential home improvements, hospitality style applications, healthcare privacy solutions and in live events or entertainment. We have seen some incredible applications of switchable technology, from use in furniture to motor yachts. 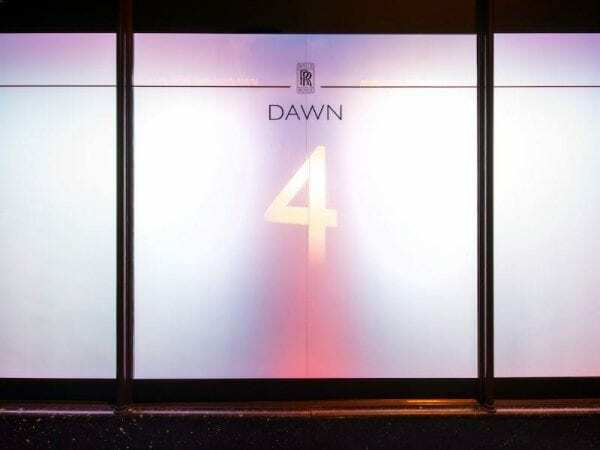 To make it even more functional, it can be granted touch functionality, and when considering that, in its frosted state, switchable glass or film can be used as a high definition projection screen to display anything from corporate presentations to backdrops for live events. Pro Display’s Transparent LCD touch screen helps Ouno Creative to deliver an engaging interactive centrepiece in the GKN Aerospace pavilion at this year’s Farnborough Airshow. 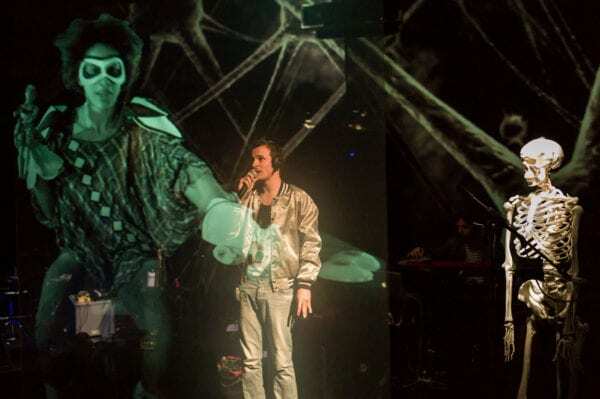 Pro Display’s Clearview transparent projection screens play a starring role in stage performance ‘Signal To Noise’ by artist collective pulp.noir. 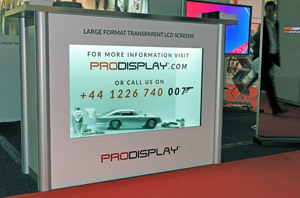 Pro Display offers a range of innovative display products which compliment transparent technology perfectly. In addition to the products mentioned in this article, there is a wealth of information about our audio/visual options available to you on our website, everything from front projection screens to our Soundpod Surface Speakers. If you have some ideas about how you would like to integrate our technology into your project, please get in touch using the form below, or call us on +44 (0)1226 740 007.